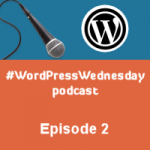 This #WordPressWednesdat podcast episode is about WordCamp. I go to a lot of WordCamps, and people always ask me about what they are, how they are organized, and a whole bunch of other questions. I fit 5 things you may or may not known about WordCamp into 15 minutes. I could talk a lot more about WordCamp, but the #WordPressWednesday podcast series is intended to be short episodes, and about anything WordPress-related. WordCamps are run by volunteers. What does it takes to organize a WordCamp? What kind of topics you can expect to experience at a WordCamp? Answer how you can help your local WordCamp. For a while, I’ve been using a cracked microphone and some outdated equipment. I’ve recently bought better podcasting and video software to enhance my podcast. This means that aside from the #WordPressWednesday podcast series, you’ll have the choice of taking advantage of the normal Blondish.net podcast. I will also be tackling 10 more of my past WordCamp presentations, so I can add them to the website. I’m excited about this, and hope you are too, as I enjoy podcasting. This may also make it easier for me to bring on guests. Congrats on your second podcast Nile! I truly didn´t know Wordcamps even exist or what they were. Thanks for letting all of us know! I think this is very helpful post for everyone to need this. Learn a lot from your blog.Thanks for mentioning me alongside some great bloggers. Hey Niles,Great post ! Thanks. I see a tendency that is becoming more important. great tendency by you in this post.. Thanks a lot for sharing with us.